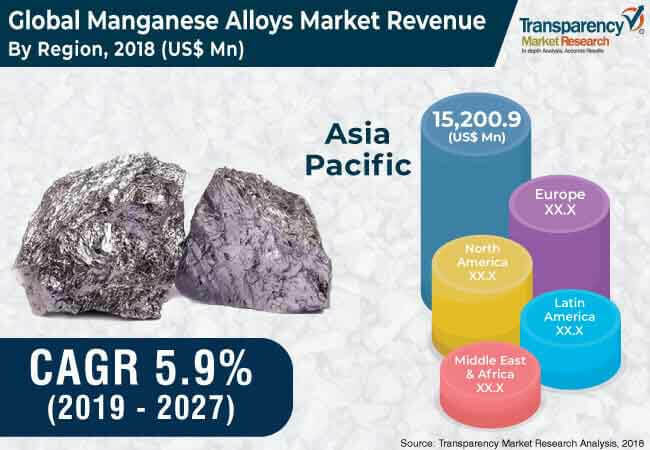 The global manganese alloys market was valued at US$ 19,722.2 Mn in 2018 and is anticipated to expand at a CAGR of 5.9% from 2019 to 2027 according to a new report titled “Manganese Alloys Market - Global Industry Analysis, Size, Share, Growth, Trends, and Forecast, 2019–2027” by Transparency Market Research (TMR) . Growth in automobile and infrastructure industries is encouraging investors to invest in the manufacturing of steel and superalloys. This, in turn, is projected to propel the manganese alloys market. Expansion of the manganese alloys market is depends on the growth of the steel industry. More than 60% of manganese alloys are employed for steelmaking. After steel, superalloys, and alloys are extensively manufactured from manganese alloys. Growth in the steel manufacturing industry across the globe propels the demand for manganese alloys. Manganese ore is less abundant than iron ore. The production cost of ferromanganese is significantly higher than that of silicomanganese. Hence, the demand for silicomanganese is high in countries such as the U.S., China, India, Russia & CIS, and Brazil. Infrastructure development is pivotal for industrial growth. Large quantity of iron and steel is required for infrastructure development. Demand for steel products is estimated to increase in the next few years due to rise in investments in the infrastructure sector. In terms of consumption, the infrastructure sector accounts for 9% of the global steel industry. Market share of the sector is expected to increase to 11% by 2026. Several governments have imposed stringent mining regulations on the extraction of manganese to curb environmental pollution caused due to the harmful effects of manganese mining. This is likely to hamper the production cost of manganese alloys. The U.S. Environmental Protection Agency has promulgated the Iron and Steel (I&S) Effluent Guidelines and Standards (40 CFR Part 420) in 1974, and amended the regulation in 1976, 1982, 1984, 2002, and 2005. The regulation covers regulatory norms engaged in iron or steel manufacturing, forming, finishing, and coke manufacturing. In terms of value, Asia Pacific dominated manganese alloys market in 2018. Rise in investments in infrastructure and automobile sectors in Asia Pacific drives the manganese alloys in the region. In terms of automobile unit production, the automotive industry in China is one of the largest in the world. The industrial sector accounts for around 27.6% of India’s GDP. The global manganese alloys market is highly competitive. Key players operating in the global manganese alloy market include ERAMET S.A., South32, Ferroglobe, ArcelorMittal, Jindal Stainless Ltd, Sakura Ferroalloys SDN BHD, Pertama Ferroalloys Sdn. Bhd., Mortex Group, Georgian American Alloys, Nikopol Ferroalloy Plant, and Maithan Alloys Ltd.